The designers paid particular attention to ease as the development of racing cars. 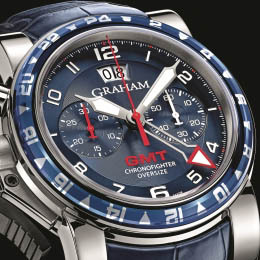 The 47 mm watchcase, devoted to the 60th anniversary of the Macau Grand Prix, is made of carbon nanotubes. The dial features a tachymeter scale with yellow Arabic numerals on its periphery. White Arabic numerals look very nice on the black dial. The hands, covered with white luminous coating, carry out the indication of hours and minutes. A central red hand performs the indication of seconds. Between 8 and 9 o`clock positions is a round date aperture. One of the pointers at the 3 o`clock position is equipped with white Arabic numerals and a red hand, and the second - with yellow numbers and a red arrow. The new Chronofighter Oversize Superlight GT Asia watch operates on the base of the self-winding mechanism G1747, on the 25 jewels, with a 48-hour power reserve and an Incabloc system of protection against external influences. A red rubber strap red, decorated with the Clous de Paris pattern, complements the model. The watch is delivered with a black strap.